The June 2016 TeachingAndLearningToolbox.com blog introduced Kahoot as an engaging in-class gamification technology tool; however, the value of Kahoot now extends beyond the classroom. Using the new Kahoot Challenges feature, you can now create interactive out-of-class assignments too. To assign a Kahoot Challenge, simply (1) create or select an existing Kahoot, (2) select challenge, (3) set a deadline, (4) share the link or pin, and (5) then wait for students to accept the challenge on their smart devices, using the mobile Kahoot app (kahoot.com/mobile-app). 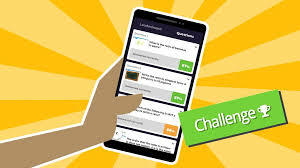 Kahoot Challenges are a great way to connect with student between classes. Use Kahoot Challenges to increase pre-work completion, make homework activities engaging or supplement exam reviews. With Kahoot’s auto-grading feature, you save the participant’s Kahoot Challenge scores in Google Drive or Excel, using the My Results feature.